Device Management System for reusing and refurbishing, erasing hard-drives, and diagnosing components. Tracking systems at component level that can provide global coverage by connecting with eReuse.org servers. Global Open-Data Store with metrics e.g. the social impact of reusing, durability of components, and tracking. 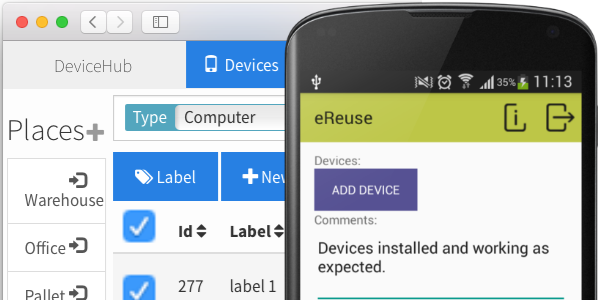 Base licenses and deed of assignment templates for transferring devices with the circular values of eReuse.org. We are a community of refurbishers, reuse advocates, social inclusion organizations, recycling companies, public administration, university service-learning programs, charity donation programs, and IT companies. Refurbishers, like Solidança, use the software to prepare and manage devices to be traded or donated, ensuring giver's donation policy, and final disposal. Each year 500 students from the Catalan Polytechnic University cooperate in repairing and installing free software to computers that are donated to NGOs. The Barcelona government donates PC to schools and NGOs. The eReuse.org base licenses ensure their correct treatment and facilitate the NGOs and refurbishers to work with them. Our community talks in video about eReuse.org. Share stories to communicate the social value of reuse and recycling. Reduce the cost of refurbishing and reusing by developing open-data and open-source tools and services. 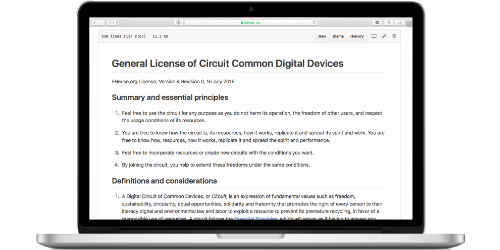 Develop open data of electronic components to compute circularity metrics, like the extended durability of devices. Prevent illegal export of WEEE by promoting reuse quality standards. Develop open data about reusing and recycling traceability to build confidence in donors and governments. Promote electronic refurbishing and reusing by exchanging and creating new business models around circular economy. Ensure reusing and recycling by providing traceability at component level. We welcome any initiative focused on refurbishing, reusing, and promoting Zero Waste on electronic equipment in general. Open information is freedom. Report non-personal device metadata to evaluate product circularity, social impact, and appropriate recycling. Share your skills and pick up a few new ones along the way by writing open-source code, testing, providing support, translating, among others. Circuits are communities that exchange devices. Empower them or create new ones using our know-how and tools. Pangea.org,la asociación que acoge el proyecto ereuse.org, ha sido una entidad pionera en facilitar el uso ético de las tecnologías, tanto que ya hace 25 años que trabajan, cuando apenas la red de internet se introducía en el Estado y se iniciaban sus primeros usos comerciales. Por esta causa, Pangea quiere celebrar su 25 aniversario. Serrá el próximo viernes, 23 de noviembre a las 18 horas en la Lleieltat SantSenca. Te reservas la fecha? Habrá gente interesante con la que hablar, música y alguna que otra sorpresa. Aquí tienes más información. Pangea.org, the association under which the ereuse.org project is developed, has been the pioneer entity in facilitating the ethical use of technologies, so much so that 25 years ago it turned around, when the internet was just introduced to the state and its first commercial uses began. Because of this, Pangea wants to celebrate this 25th anniversary. It will be next Friday, November 23 at 6 pm in Lleieltat Santsenca. Are you booking the date? There will be people who will talk, there will be music and there will be some surprise. You’ll fins more information here.